Chris Bickley Discusses Eynomia And "Break Free" - Welcome To All That Shreds Magazine! 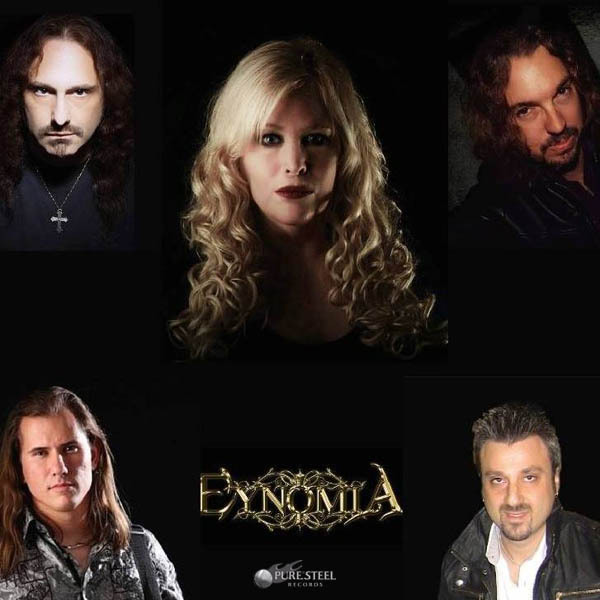 EYNOMIA’s upcoming album is titled “Break Free.” The musical abilities of the band have a range from FIFTH ANGEL over SYMPHONY X to QUEENSRYCHE. The songs are even more catchy than the ones from the named bands but as powerful and finally the female vocalist Phyllis Rutter is singing on a high-end level! Coming from Minneapolis besides Phyllis Rutter we have guitarist Chris Bickley (Christine Ohlman Band, Thunderhead), bass-legend Mike LePond (SymphonyX, Mike LePond’s Silent Assassins, Heathen’s Rage), Jimmy Pitts (Christian Muenzer Band, Fountainhead) on the keys and drummer Gaetano Nicolosi (RonKeel Band). CB: I met Phyllis on Facebook we shared some of the same interest musically. She and I had some material, and we decided to work on few of them together to see how it would come out. Afterwards, we decided we liked the material and felt we should try to move forward with it and brought in friends Jimmy Pitts, Gaetano Nicolosi and Mike Lepond. How was the songwriting and music split up? CB: Phyllis had co-written a few songs with a guitarist named Rich Lassahn. Some of the arrangements needed some dialing in from the demos. Jimmy added a lot of counter melodies to all of the material. I co-wrote about three songs with Phyllis. Did you approach Puresteel or did they approach you? CB: After we finished recording, we decided to do some shopping to see if there was some interest. We believed in the album after it was finished and had hoped to find a label who would want to be apart of what we were trying to create. PureSteel had replied immediately to our EPK and shared our vision of the material and the direction. And the rest is history. How did you come up with the band name, Eynomia? CB: Funny thing… Phyllis came up with the name of a Greek god, so the name is a play on that. “Eunomia” was the goddess of law and legislation. The name translates to good order or governing from good laws. I always loved Greek mythology, and it felt right, and it also was in my opinion memorable. Did you write the lyrics or music first? CB: With most of the songs, the music was written first then the lyrics. What age did you start playing Guitar? CB: I started at 16 years old. CB: 1987 NJ series B.C. Rich Mockingbird it was candy red with gold hardware with a Kahler flyer and DiMarzio pickups was a heavy, heavy guitar but sounded great. And a killer neck on it. Kind of miss that one. CB: My style tends to be a little on the bluesy side. I tend to like to play along with songs I never was much about playing on top of them. I love being an accompaniment to the bands I’m involved in. I have a lot of influences, and I tend to be a little of everything. But Blues or Blues Rock always was my foundation and from the position of where I come from so when writing or playing guitar. I like to think it adds something different in the records or bands I play with. Walk me through your rig setup. CB: For this band is using an Engl Thunder reverb for live. With a Boss TU2, digital delay and Boss chorus pedal. Sometimes I carry an RMC Wah pedal. For guitars, I’m still using my Rick Hanes signature guitar with the piezo and custom four seasons pickups. I’m also using 2 Dean guitars, one six string with a Floyd Rose and one seven string both with EMG’s. In the studio its a mixture of Fractal Axe-Fx and micing amps and acoustic guitars (I’m using a Luna Nouveau). I like using my B.C. Rich ST3’s and Assassin guitars for recording leads, and I still use my Dean 7 string. I also use my vintage Gibson Les Paul for some bigger guitar parts. CB: Oh man some early influences for bands Ozzy / Black Sabbath, Iron Maiden, Dio, Metallica, Megadeth, Queensryche, Badlands, and Whitesnake. And for guitarists, I loved players like Dan Huff, Jake E. Lee, Andy Timmons, John Sykes, and Eddie Van Halen these guitar players and bands are some of my favorite of all time and had some serious impact on me. Will you be touring in support of this record? CB: We are sincerely hoping to do some shows to support the record. The bands intent is to be actively touring and recording. Right now we have not booked anything yet. Killer sound and great talent! I hope they tour soon, I would love to see them live! Next Next post: Are You Ready For NAMM 2018?